Ben Folds Five On World Cafe : World Cafe The wildly popular pianist and his re-formed band join host David Dye for a four-song set in the World Cafe studio. 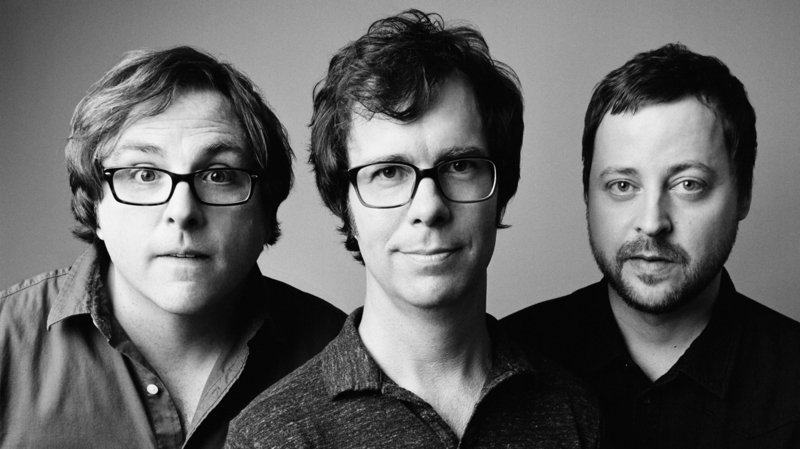 (From left) Robert Sledge, Ben Folds and Darren Jessee of Ben Folds Five. "Thank You For Breaking My Heart"
Three albums into a thriving career, Ben Folds Five abruptly announced it was over in 2000. Luckily for fans, Folds got the band back together 11 years later and even released a new album, The Sound of the Life of the Mind, this September. The album is classic Ben Folds Five — at times irreverent, cerebral, quirky, wistful and playful. The Sound of the Life of the Mind peaked at No. 10 on the Billboard 200 and the video for the first single, "Do It Anyway," features Anna Kendrick, Rob Corddry and the cast of Fraggle Rock. In this edition of World Cafe, Folds, Robert Sledge and Darren Jessee join David Dye in the studio for a four-song set.